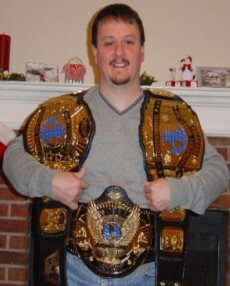 Here are pictures of Chris Pages WW IC Title. It's a 5 plater based on the design of the old school Reggie IC (Yellow Strap which the Ultimate Warrior made famous at Wrestlemania VI). This belt also sports a WW logo plate and tip. The reason behind the WW logo is that it was the closest thing you could get at the time to the old WWF logo without having to pay the $1000 extra fee. However several months ago WWE copyrighted this logo too as it's now used by John Cena. So therefore this is truly a one of a kind Old School IC with a now copyrighted logo.